This page is under reconstruction. The old contents below are being replaced by the artist's comments his interest in the American West and its development as depicted in paintings and movies. "I enjoy doing paintings that tell stories ... scenes with action in them. Western art has my attention as an inspiration for drawing and painting action." - Bob Glover. 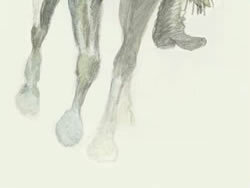 CLICK HERE for details about the pencil and watercolor of the horse and rider on the left. More information below about additional works shown. The watercolor below is a study done from photographs of barrel racing competitions. 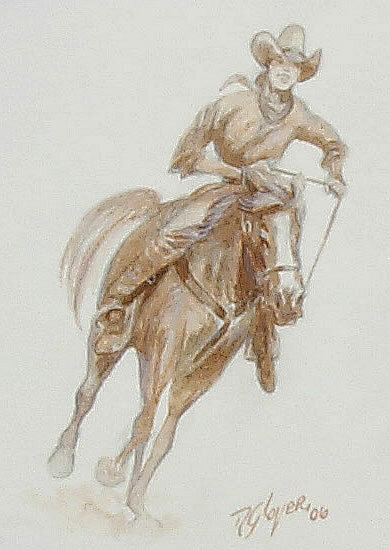 The watercolor sketch above was inspired by scenes from the John Ford western, She Wore a Yellow Ribbon. The scene is a series of takes of actor, Ben Johnson, riding hard through Monument Valley. Johnson plays to role of Argent Tyree, sent out alone to scout for hostile Indians, instead, they found him and gave chase. The sketch was done in preparation for a series of finished works and other sketches which are all titled by the artist as Tyree's Ride. The series is not copies of movie scenes, rather it is inspired by them. The artist uses his own sketches and photographs from numerous hikes in the Four Corners area. Shots of horses and riders were sketched, however, from freeze-framed DVD movie scenes. ... a series of motion picture film frames that show a setting in which there is continuous related action. A scene may be a series of shots or a single cinematic take. ... a series of motion picture film frames exposed during an uninterrupted camera run, a take.